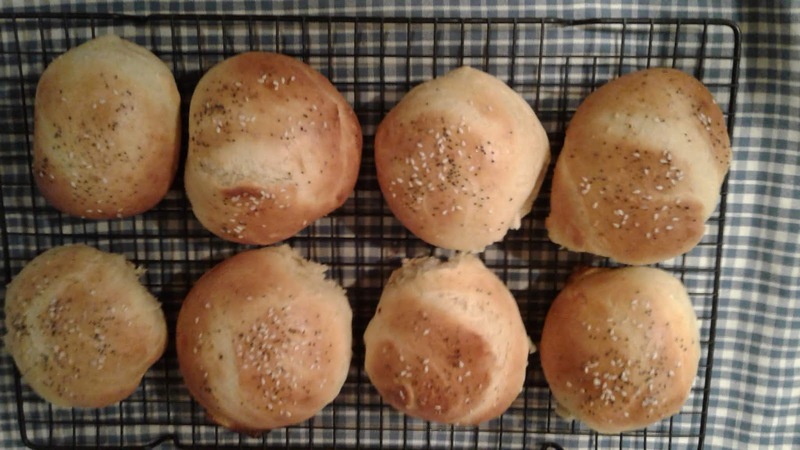 Making sandwich rolls from scratch in one hour is child's play! **NOTE: The seeds are optional, use these or whatever type you like (or no seeds at all). Pour the warm water and yeast into the EZ DOH container and stir to dissolve the yeast. Let that rest one minute, then add in one cup of the flour, followed by the rest of the dough ingredients (including the remaining 2 and 1/2 cups of flour). Then use the EZ DOH hand mixing attachment to combine and mix the ingredients for 2 or 3 minutes (by then your dough should be slightly sticky and all ingredients mixed thoroughly). See our website video if you need any help. Now, lightly flour a clean and dry flat surface (counter top is fine) and remove the dough from the container and place it on the floured surface. Turn and gently knead the dough several times in order to smooth it and form a uniform shape. If you lightly flour your hands it will keep the dough from sticking. 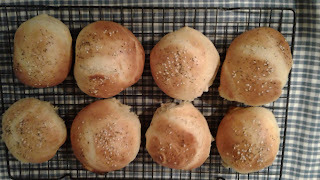 Divide the dough evenly to make 8 large rolls (or make 12 medium sized rolls), and then hand roll these (again, flour your hands to prevent sticking) into a round shape and place them on a greased baking pan. Cover gently with a clean tea towel and let the dough rise for 10 minutes. Now, pre-heat your oven to 425 degrees. While the oven is warming, separate the yolk from the egg white and mix the yolk with the 2 TBSP of milk to form your egg wash. After the dough has risen for 10 (or more) minutes, remove the towel and gently brush the egg wash on top of each roll (the egg wash helps the rolls brown evenly and allow your salt, pepper, and seeds to stay in place). Sprinkle each roll by hand with the salt, pepper, and seeds. Then place the cooking sheet in the oven and cook for about 15 minutes or until the tops are golden brown. If you have a cooking thermometer, the rolls are done when the temperature inside the rolls reaches 190 degrees. Remove the rolls from the pan (if they are sticking to the cooking pan, use a spatula to loosen them) and place them on a cooling rack so they can cool down enough to eat. This recipe works due to the ingredients (including the extra yeast). They won't be as chewy as rolls that have gone through a more intensive process, but they will taste great and the faster process allows young people to quickly see and taste the results of their efforts.